New research has revealed the missing link to pain-free living: a balanced nervous system and healthy connective tissue. These two components work together to provide your body support and optimal mind-body communication. MELT directly addresses these two systems of your body in a way no other self-treatment can, including diet and exercise. You’ll see and feel results in the first session. The ultimate goal of MELT is to improve your body’s ability to restore balance and repair itself, which can create remarkable, lasting changes. Using specialized techniques, a soft body roller, and four different small balls, MELT rehydrates the connective tissue, rebalances the nervous system, and restores space to compressed joints. This revolutionary approach is backed by the latest science and acclaimed by hundreds of thousands of devoted MELTers around the world! Now it’s your turn! MELT Hand and Foot Treatment Kit Shop Now! MELT is for anyone who wants to slow down the aging process and live pain-free. For women and men over 40 who want to stay active, mobile, and independent – MELT is a must. 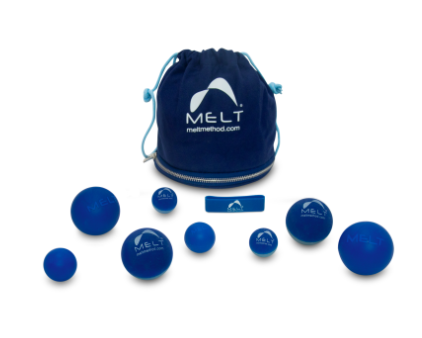 MELT is also for active younger adults and athletes who want to maintain a healthy body and achieve optimal performance without debilitating wear and tear. Even children can benefit from MELT. If you are injured, post-surgery, pregnant, overweight, sedentary, out of shape, or have limited mobility, chronic pain, knee or hip replacements, or bone disorders – you can still MELT. It’s the best starting point for any exercise and wellness program. People who MELT regularly find that they want to exercise more often. It’s just more fun to move when your body feels good, has more energy, and is free of pain. Investment for 90 minute Intro Workshop is $30.